Here we periodically publish a chart and a brief excerpt from one of our premium research reports, a link or a video from one of our appearances in the financial media, or a notification that one of our price targets has been met, for the purpose of familiarizing potential subscriber with our investment research and to stay on the radar of those who have expressed an interest in us. Anyone can sign up to receive our research excerpts, free of charge, by completing the Subscribe To Our Blog box at right. Professional investors can request a free trial of our premium research by clicking here and typing TRIAL REQUEST in the “Reason For Inquiry” box. The US Stock Market: Sell In May And Go Away? 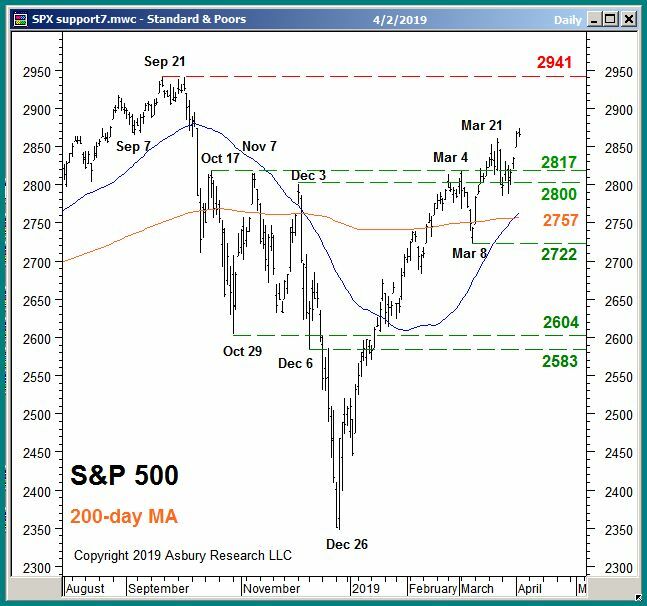 In our previous April 2nd update, we pointed out that the S&P 500 (SPX) was moving above important overhead resistance at 2800 to 2817 and said this cleared the way for a retest of the broad market index’s September 2018 all-time high of 2941. SPX has since risen by an additional 51 points or 1.8%, as expected, and is now positioned just below these all-time highs — setting up another near term decision point for the market, and the likely springboard for its next significant directional move. Does the 2019 uptrend continue from here, or does the well-known “sell in May and go away” seasonal decline begin? We are currently watching a short list of particularly relevant and important indexes and metrics to make this determination — and as soon as possible. One of these is the NASDAQ 100 Index (NDX), which represents market-leading technology stocks. The chart below plots NDX daily since mid August with its 200-day moving average, a widely-watched major trend proxy. Not shown is that NDX has been outperforming SPX since late November 2018, leading the US broad market higher. 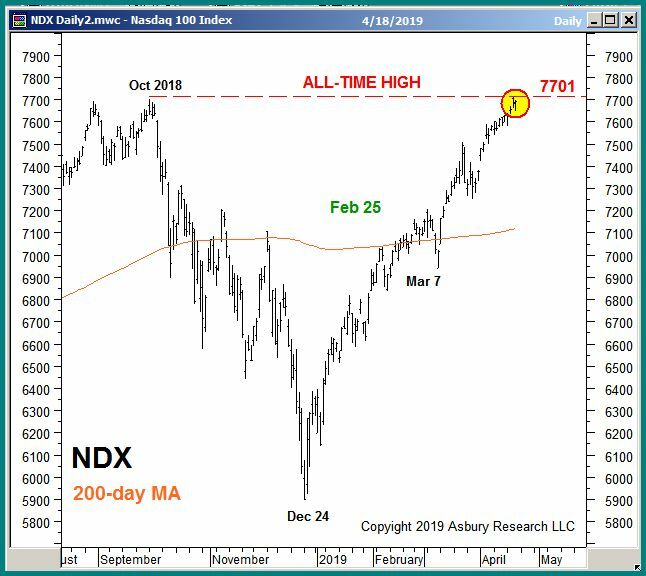 The red highlights show that this index has spent the past two days (April 17th and 18th) bumping up against its 7701 October 2018 all-time highs, which is major resistance. Considering Technology’s propensity to lead the US broad market both higher and lower, and NDX’s nearly lockstep positive correlation to SPX over the past 30 years, how NDX resolves this test of major resistance is likely to be a coincident — if not leading — indication of whether the 2019 US broad market advance continues its torrid pace into the summer or begins an overdue corrective decline. The video below shows how we have managed investor assets, in real time, amid the latest market conditions for our Asbury Research Management clients. Click Here for our 04/19/2019 Video Review, which explains how we have recently utilized Asbury Research’s market analysis and investment ideas to professionally manage client portfolios. AIM offers a unique approach to investment management that is dynamic, based on the current condition and risk/reward profile of the financial markets, rather than on whatever your investment allocation may have been pre-determined to be. In our previous February 26th update, we pointed out that the S&P 500 (SPX) had risen by 228 points or 9% since January 9th-10th, when our Asbury 6 key internal market metrics and Correction Protection Model CPM) switched back to a Risk On mode, but was testing formidable overhead resistance at 2800 to 2817. A little more than two weeks later, the lime green highlights on the chart below show that SPX first declined to test primary support at 2752 to 2739 on March 8th, then quickly rebounded to retest 2800 to 2817 resistance. This quick rebound from support probably represents an aggressive “buy the dip” mentality by what we believe is a large contingent of investors that missed the initial sharp rally off the late December lows, and promised themselves to buy the next minor decline into support — which is precisely what the decline into SPX 2752 to 2739 was. Meanwhile, our Asbury 6 internal market metrics are currently split right down the middle between positive and negative signals. which tells us that investors are collectively uncertain about what the market’s next direction will be. Once this is resolved, we believe it will lead into at least the next 4% to 5% directional move in the US broad market. Stay tuned. Click Here for our 03/13/2019 Video Review, which explains how we have recently utilized Asbury Research’s market analysis and investment ideas to professionally manage client portfolios. 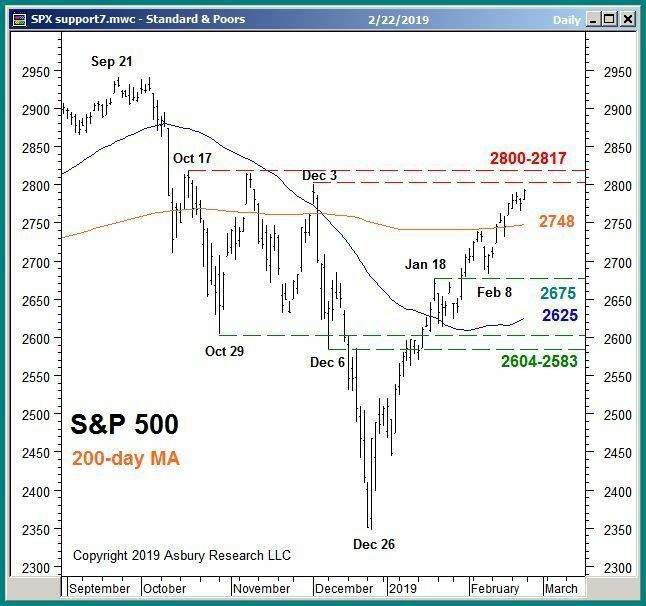 In our previous February 5th update, we pointed out that the benchmark S&P 500 (SPX) was testing its 200-day moving average, a widely-watched major trend proxy, as overhead resistance. You may recall that the sharp 4th Quarter decline in SPX didn’t really started to accelerate until the 200-day MA was broken to the downside, on October 11th, and then proceeded to collapse by an additional 381 points or 14% into the late December lows. About two weeks later, on January 9th, our Asbury 6 key internal market metrics all turned back to positive (bullish) and one day later, on January 10th, our Correction Protection Model CPM) switched back to a Risk On mode. The S&P 500 has subsequently risen by 228 points or 9% but is now testing formidable overhead resistance at 2800 to 2817. This level can be seen in the chart below, and is also displayed and discussed in our latest tactical video. See the link to it near the bottom of this page. 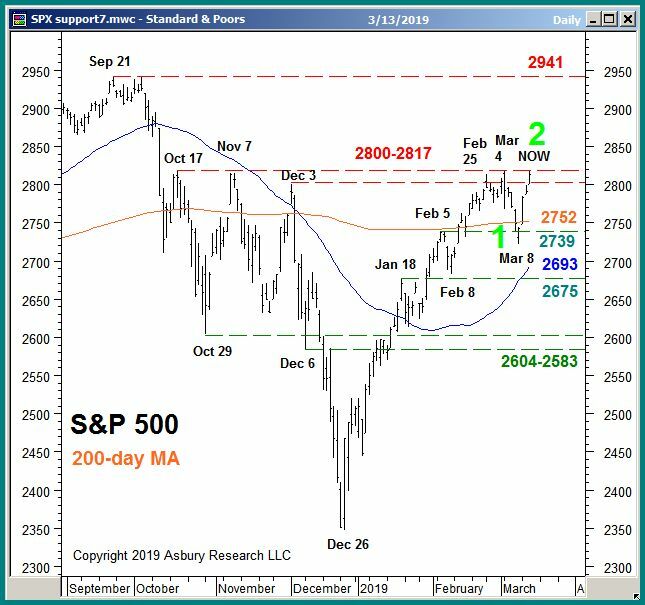 We view the SPX 2800 to 2817 level as an important intermediate term inflection point, from which the US broad market index is likely to either extend its 2019 advance to retest the 2941 September 20188 all-time highs, or begin an overdue — and potentially sharp — downside correction. As we see it, one of our primary roles at Asbury Research is keep our subscribers from losing money in the market. We do this by analyzing market conditions every day because, most of the time, you can spot emerging trouble before it becomes apparent in the major indexes. That is, if you know where to look. One of the ways we do this is via our Asbury 6, six key market internals. We think of the Asbury 6 as the cylinders of a six cylinder car. When all six are firing, the car continues moving down the road, over hills and around obstacles. However, if these cylinders stop functioning, then one-by-one, little-by-little, the car loses its ability to continue moving forward. The following are recent examples of how this metric works in both Risk Off and Risk On Environments. This negative shift in stock market internals, which occurred just 13 days after the S&P 500 (SPX) set its all-time high on September 21st, preceded a 438.00 point, 16% decline by SPX into the December 26th lows. More recently, on January 9th, the table below shows that four of the Asbury 6 moved back into positive territory to indicate an emerging Risk On Environment. The S&P 500 has since risen by 123.00 points or 5%. The final table below shows that, as of today, all six of the Asbury 6 are in positive territory. As long as the Asbury 6 remain positive, the current rally will continue. If they start to turn negative, however, it will indicate the market’s vulnerability to another decline. Moreover, the longer the Asbury 6 remain negative, the longer the decline will last. And, most important, based on past performance, our clients should know that the next market decline is coming before it has a chance to do serious damage to their portfolios. Asbury Research subscribers can view our latest research on the US stock market, market sectors, US interest rates, ETFs and commodities, as well as a table with our current picks in US stocks, ETFs, and global indexes, by logging into the Research Center via the big gold button in the upper right corner of the screen. To non-subscribers: Request more information about us, including service and pricing options, by visiting our Contact Us page or by calling 888-960-0005. For asset management, please visit the Asbury Investment Management (AIM) website. You are receiving this special holiday offer because you have previously requested information about our investment research. but have been putting it off, this is a great time to act. between now and midnight on December 31st, 2018 only we will take 20% off of the price that we previously quoted you during 2018 for our research services. If you need us to resend your pricing information, just contact us at sales@asburyresearch.com and we will provide you with that information, including a description of services provided and a new quote that includes your 20% discount. when a limited number of available subscriptions runs out. 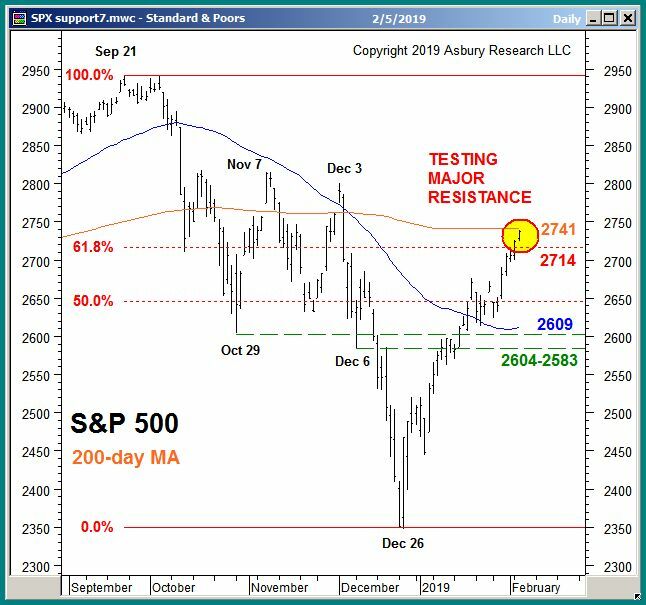 Our previous Asbury Research’s Stock Market Update & Asbury Investment Management Video, dated December 14th, was entitled US Stock Market: On The Brink Of A Deeper Decline. The benchmark S&P 500 (SPX) closed at 2600 on that day and subsequently collapsed by an additional 253 points or 9.7% by December 26th. The US stock market, and global stock markets in general, remain in the midst of a major downtrend that we first started warning investors about, and first started protecting investor portfolios from, back in early October. You can go back through previous issues of this update to see how we were approaching this situation as it emerged. measure the market’s internal strength at each one of these levels to determine if there is enough of a positive change to first facilitate a bottom and then, ideally, to fuel a bullish reversal. Several key price levels below the market have already been tested but, at least thus far, none of them has held because our key market internals — which we call The Asbury 6 as shown in the table below — have been negative across the board. When all Asbury 6 are positive, market internals are the most conducive to adding risk to portfolios. Each negative reading adds an additional element of risk to participating in current or new investment ideas. We update this table daily and make it available to Asbury Research subscribers. The Asbury 6 is also an important component of the process we use to manage risk in client portfolios — which helped us to avoid most of this nasty 4th Quarter decline. The video below shows in more detail how we have navigated these treacherous conditions for Asbury Research Management clients over the past several weeks. Click Here for our 12/27/2018 Video Review, which explains how we have used Asbury Research’s market analysis and investment ideas to professionally manage client portfolios. John Kosar, CMT, is Director of Research at Asbury Research LLC. John, a 30 year veteran of the US financial markets, spent the first half of his career on the trading floors of the Chicago futures exchanges where he had the opportunity to learn how the financial markets work from the inside out. This experience, early in his career, became the foundation for the unique insight and perspective that defines Asbury Research. John is frequently quoted in the media and appears regularly on financial television. He was awarded the Chartered Market Technician (CMT) designation in 1999, is a former Vice President of the Market Technicians Association (MTA) and served on its Board of Directors between 2002 and 2006.